Riding through Santa Monica between art and culture venues during the SMMoA Tour da Arts ride. I’ll take a moment to respond to the archetypical script of grievances. 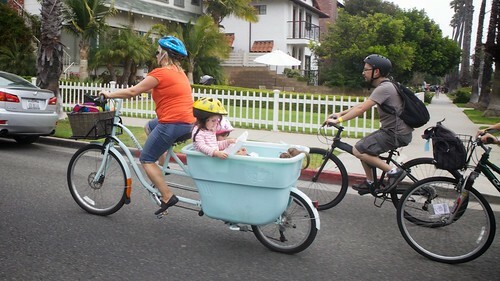 Before we get to the bicycling, I want to address the raised concerns over population, density, housing, and make it clear, that until the past few years, Santa Monica was not adding much of anything to its net-residency. A lot of comments get thrown around that suggest the dreaded “D-word”, density, is a major culprit that has been growing relentlessly for decades driving local traffic frustrations. 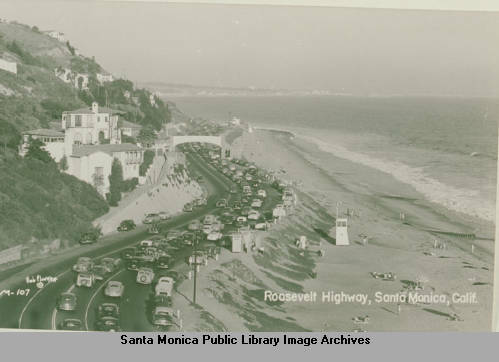 Even as residential development had been gradually added to the downtown for a number of years, the total population of Santa Monica was largely flat for decades, adding only 6,487 people between 1960 and 2010, a growth of only 7.7%. During some of those years it even ticked backward as evidenced in the 1990 and 2000 census. During the same five decades the county of Los Angeles added more than 3.7 million people, a growth of about 63% over the 1970 population figures. Any substantial growth that occurred in car trips in Santa Monica during that time (at least in my time visiting and living here it doesn’t seem to much different), is not rooted primarily in our local residential population growth or density. That 1960-2010 era of Santa Monica was the time in which a slow growth/no growth local agenda had succeeded, at least on housing and population. The rapid population growth rates of the city of Santa Monica from the 1890’s to the 1950’s (leaps like 134% growth in the 30’s) had come to a screeching halt after the 60’s. If anything, a revival in job growth, coupled with all the population growth being pushed around elsewhere in the county further away, creating the regional jobs and housing mismatch, is a much bigger factor. However even that dynamic doesn’t necessarily guarantee vastly more cars trips if we had prioritized transportation policy differently. Santa Monica has also always been a focal point of regional tourism day trips, and our region has grown, but the opportunities to live close enough to actually easily bike to the tremendously popular bike path, has not. The concerns over rising rents are real, for those of who haven’t been around long enough to sit on rents frozen in the 70’s anyways. But within the context of our predominately market force driven system, those decades without adding housing, during a regional boom of population, in part ensured todays rising premiums over other areas, including other regional coastal cities. Newer housing is also always more costly than older housing, which is compounded further by regulations that came after much of the older housing stock was built. Like the high parking minimums ensuring the overbuilding of highly costly subterranean parking in all recent construction. Where I live, near Memorial Park, still walkable to the downtown, is for the area, quite cheap, but that is a product of being a fairly small unit in an older building, and the disadvantage (for some, I don’t care since I don’t own a car) of no off street parking. Bundled parking can add hundreds of dollars to the rent of a unit over a comparable one built at the same time without one. 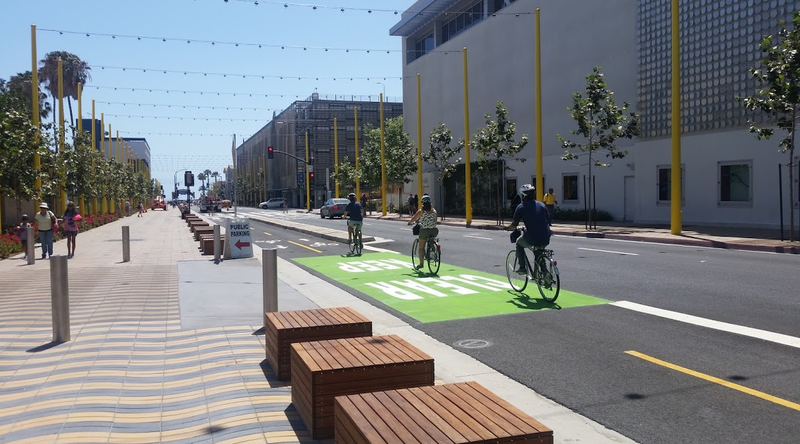 Another market factor here, is the premium created by the desirability that comes with the things people love about many of Santa Monica’s efforts of recent years and decades, like enhanced bikeability and walkability. That’s part why so many come here even if they can’t live here. Those traits are especially sought after by many of todays’s younger people who are driving less, delaying or forgoing getting licenses, and owning fewer cars than their parents did at the same age . 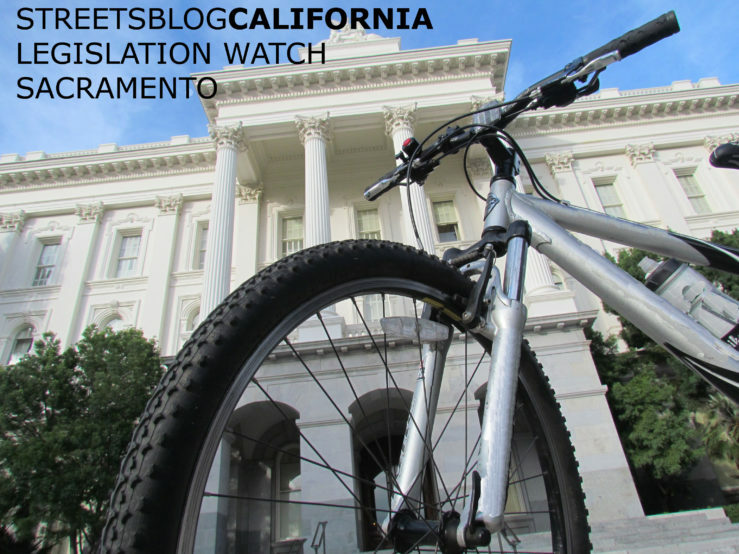 While we cannot replicate the beach proximity (although I do want more housing accessibility here), we can work toward improving bicycling, pedestrian orientation, and transit access throughout the region. I do not believe those are traits and assets that should be kept as exclusive as they have been. Mr. Feldman’s lament is cast as a warning Los Angeles and oddly enough Pasadena (which if he hasn’t noticed has had the gold line, transit oriented development, and a growing bike network for many years), against replicating the perceived dire ills of Santa Monicaness. Nowhere is perfect, but the truth is Santa Monica has gotten a lot of things right, and there lessons that can be drawn from its experience and ought to be considered and applied elsewhere in the region. The ease with which I’ve been able to live, work, & do my daily errands without a car since I got rid of it in 2008, 2 years after moving here, should not be a privilege. It is a perversity to build our cities in such a manner that owning and operating a machine that burns through wealth and pollutes our air be a near prerequisite to existing. About the bike lanes Mr. Feldman despises so much, where the existing bike lane network was coupled with loss of a lane for vehicle traffic, the implementation was often driven first by safety. A “road diet” such as the one depicted in the story, on Ocean Park Blvd. implemented many years ago now (but more recently getting some green west of Lincoln), often has negligible difference to trip times, in part by reducing confusion at turns when dedicated turn pockets did exist before, tend to reduce the most hazardous top end speeding, and reduce crash rates for all street users, be they in car, on bike or on foot. In the case of Ocean Park Blvd. City planners like Lucy Dyke are quick to point out 50% reductions in crashes in their before and after analysis. If some prefer that we kill and injure more people for the sake preserving the ease of speeding around an urbanized area, they are entitled to their view. However, I am also entitled to point out the callousness of such views and defend governance that values the lives of all its citizens, and works to serve more than the perceived convenience of an imagined superior class of motoring travelers. In my experience when engaging either online or in person, with those who most despise the bikes and the transit and all the rest of it, but most of all claim to hate all the car traffic they participate in creating, they actually aren’t really willing to do anything about car traffic. Finger pointing is as far as it goes, and the moment any discussion of policy measures (or removing long standing car encouragement measures in places for decades) the conversation shuts down. Part of problem is any effective measure to truly reduce car traffic, limiting parking quantity (or at least not forcing parking growth) and raising rates on parking, highway or area congestion charging, etc. begins by implicating everyone who drives as responsible, and all must share in the burden toward solutions. However such logic is not suitable to those only interested in pointing fingers from behind the windshield. For such advocates, they want their cake and to eat it too, they want policy subsidies to ensure it’s easy, cheap and convenient to drive everywhere, ensuring that yes many will drive everywhere, and in doing so perpetuate the misery for all who do (and many of us who don’t too). There just is no path out of automobile traffic congestion in a vastly populated metropolis by catering only to making driving accessible, cheap and easy. We should all know this by now after decades of every Herculean effort on behalf of freeway way widening and parking garage building throughout Los Angeles. It’s also worth noting how often the traffic and headaches are made to sound so much worse, or so much more consistently terrible than the reality. I no longer own a car, but still drive or carpool on occasion, often driving into downtown Santa Monica when my mom visits. I just pick the best route, knowing any grid turn restrictions, and the real time data on parking availability in advance, and it’s just easy, pretty consistently. The city provides much better real time data for driving into Santa Monica than it does public transit. Feldman and others can blame people riding bikes for the state of things all they want, but at the end of the day, at whatever destination, my bike will be attached to a rack outside, and that row of ideal parking spaces they wished were available, will be taken up by fellow drivers just like themselves. Previous articleCouncil Listens to Concerns and Praise for Bergamot Transit Village. Final Vote Coming Next Week. Next articleWeekly Event Preview: Bergamot Transit Village at Council, Textile Recycling Event, Free Fridays at Aquarium.